That was the reaction of Hilary Rosen, CNN political commentator, to the first Democratic Presidential Candidates Debate in Las Vegas. A Democratic strategist, she also thought it was a great night for her friend, Hillary Clinton, the former First Lady and Secretary of State. Well, there was a bit of truth to what he said: Lincoln Chaffee, former Governor of Rhode Island and US Senator, and Jim Webb, former Virginia Senator, Assistant Secretary of Defence, US Marine Corps officer, journalist and author, looked good on paper, but not on the stage. Chafee kept saying how effective he was as a Mayor, Senator and Governor, but didn’t show it during the debate, and Webb kept saying he knew how to lead, but continually complained about not getting as much time as the other candidates. Chaffee boasted about the lack of scandals in his career, and Webb, in answer to a question for the candidates about the enemy they were proudest to have made, said it was the “soldier (in Vietnam) that threw their grenade that wounded me … But he’s not around right now to talk to.” The reply fell flat on the Vegas crowd. The clear winners were Hillary Clinton and Bernie Sanders, the Independent Senator from Vermont and self-styled democratic socialist, who blasted Wall Street and the corporate giants, saying a political revolution was needed to get millions of people to vote against the billionaires who run the country. A revolution including tuition-free public universities, criminal justice reform, $15 minimum wage and electoral finance reform. You can see why the Republicans don’t like Sanders. I think Hillary finished just ahead of Bernie, but he had the quote of the night, defending Mrs Clinton over having a private email server when she was Secretary of State. She admitted it was a mistake, but the host Anderson Cooper kept pressing her on the issue. Finally, Bernie stepped in, and said: “I think the Secretary is right, and I think the American people are sick and tired of hearing about your damn emails.” That drew big cheers in Las Vegas, and Sanders continued: “The American people want to know whether we will have an oligarchy as a result of Citizens United. Enough of the emails, let’s talk about the real issues.” The audience loved that and gave him a standing ovation. Hillary leaned over and shook his hand, saying: “Thanks, Bernie.” The Los Angeles Times had a good piece on Bernie “slaying the room” in Las Vegas with his email line that also prompted a myriad of tweets. The candidates did talk about the real issues: income equality, the criminal justice system, the Middle East, paid maternity leave, the cost of a college education, gun control, immigration reform, electability and racism. The former Mayor of Baltimore and Governor of Maryland, Martin O’Malley, made up for a past mistake on the “Black Lives Matter” issue by saying the movement made the point that “we have undervalued the lives of black people and people of colour. Black lives matter and we have a lot of work to do to reform our criminal justice system and reform race relations in this country.” O’Malley was the most impressive of the three other candidates but he still has a lot of work to do to catch up to Clinton and Sanders. One of the major issues where Mrs Clinton differs with Bernie Sanders is on gun control. Hillary Clinton said he voted against the Brady Bill, requiring background checks on gun purchases, named after Jim Brady, Ronald Reagan’s press secretary, who was shot during an assassination attempt on the president. She also said he voted for a bill that helped protect the gun industry, the Protection of Lawful Commerce in Arms Act. Sanders said he believed in background checks, but he’s a senator from the rural state of Vermont and needs consensus: “What I can tell Secretary Clinton, that all the shouting in the world is not going to do what I would hope all of us want.” It’s no wonder that Hillary Clinton simply responded: “No, I do not,” when asked if she thought Bernie Sanders had been tough enough on gun control. Democratic supporters (disclosure: I am one) will continue to be bombarded by emails from both the Clinton and Sanders campaigns, asking for donations and declarations that you will back their candidate. I do like Bernie Sanders, but I’m leaning toward Hillary Clinton, simply because she is more likely to be elected. 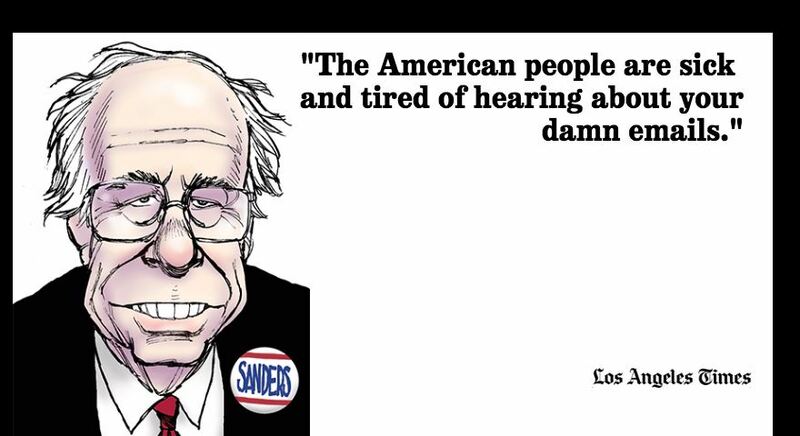 Bernie wants millions of Americans to vote against the right-wing Republicans and the disgraceful Tea Party movement. But I’m not sure he can get that many people on side, and the silent majority will still decide this election. And it’s highly unlikely the gaffe-prone Vice-President Joe Biden will join the Democratic presidential race while Hillary is in the ascendancy. A final thought: If Donald Trump can get the Republican presidential nomination, God forbid, and Hillary Clinton the nod from the Democrats, it will be a hell of an election campaign. My prediction: She will be the first woman in the White House to be called President, and not First Lady. I almost forgot: Bill Clinton will be in charge of baggage.